If you’ve been using Windows 10 since its release, you’ve no doubt come face-to-face with issues thanks to Cortana and the Start Menu. While Microsoft is moving to a rapid release cycle, like Apple, it’s causing some trouble for users on everything from old hardware to high-end laptops. 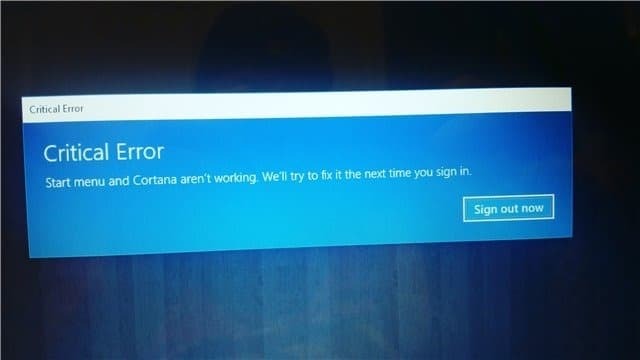 If you’ve received the critical error related to Cortana and the Start Menu, we have a quick fix. You may still see the issue, but at least you can get back up and running in the meantime. The critical error related to Cortana and the Start Menu will happen suddenly and unexpectedly. You’ll login to Windows 10, you’ll see that the Taskbar won’t load the way you’re used to it loading and then a pop-up will appear that basically renders your PC useless. You’ll still be able to interact with items on the desktop but Cortana and the Start Menu will be gone. There are several steps you can manually take to try and fix the issue. Microsoft however hasn’t been able to fix it yet via the Windows Update. The first step is to boot into Safe Mode, then restart and boot into your regular system startup. The easiest way to do this is to use CTRL + ALT + DELETE. Your system restart into its advanced startup options. Your system will begin booting to the startup settings, allowing you to choose an option. Depending on the system, choose safe mode with or without networking, it doesn’t matter which one. Once booted into Safe Mode, you’ll notice the critical error is gone in Windows 10. Now, restart your system again and boot regularly. If the error happens again, simply follow the above steps again to clear it. In some cases, users have reported removing your anti-virus program and then reinstalling it clears the error, too. When I ran into this issue personally, that wasn’t the case. Only the safe boot method cleared the error and allowed me to use Windows 10 normally again. This should clear the critical error. This doesn’t mean the error is gone forever. Hopefully Microsoft will address this issue in a future Windows update. Until Microsoft releases a fix for this in Windows 10, it may happen again. There’s no real cause for the error, although Microsoft has a laundry list of reasons for it blaming anti-virus software to faulty hardware to any other excuse not to fix the issue. As usual with Windows 10, a majority of issues are fixed by the blogging community as opposed to Microsoft taking care of critical errors that are effecting a consumer base who doesn’t know what to do with them.